Tips kamar: Both rooms are nice. The ensuite faces the garden and has a sea view. 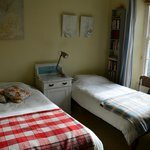 We stayed in the twin room, as it was cheaper, which is facing the back of the house. The room was nice and clean, perfect!